Any release that involves the genius of Christian Fennesz, will grab my attention; and this time he has joined in collaboration with electronic duo, OZmotic to produce an album thematically drawn from the concept of a discovery of a black box lost in the Anthropocene era. Field recordings provided the foundations for the album; but are utilised correctly as a simple bedrock to lay a wash of electronics across. OZmotic bring their fair share of Jazz influence to the mix too, but it’s done with the subtlety and desperation that the release demands, with no instrument taking over and hogging the limelight. Things really pick up on track three, ‘Run to Ruin’ with up-paced beats and modern electronica spliced with vocal samples and the unmistakable guitar of Fennesz. Once again there is a heavy Jazz element to the overall sound, but this has been drenched with the fruits of other influences. 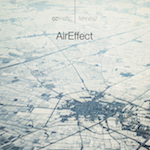 ‘Air Effect’ throws together a number of genres that shouldn’t entirely work. However, the thought processes and obvious talent behind the release, collectively have produced an intriguing, peculiar, yet ultimately listenable collection of tracks that smash together a number of opposing forces that are as engaging as they are odd. This entry was posted in Dense Promotion, Folk Wisdom, SObject. Bookmark the permalink.